As I mentioned a few months ago, I've been participating this winter in the David Foster Wallace Infinite Jest book club, Infinite Winter. This weekend I rounded the 900-page corner and have the end in sight - I think I'll finish the novel some time this week. 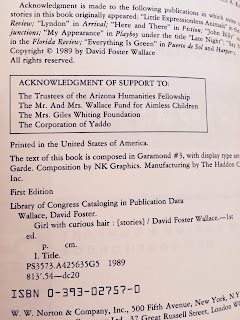 To commemorate this, I thought I'd feature one of my David Foster Wallace rarities, this first edition of Girl With Curious Hair. 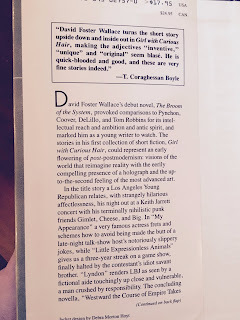 My David Foster Wallace collection has a bit of an awkward history: I was on the fence with him and his books for quite some time, having only really read his essays (which were perfectly fine, I figured at the time, but certainly not masterpieces). Coming off the heels of reading the sorta-fine-sorta-useless Both Flesh and Not I decided I wasn't into him. Overrated. 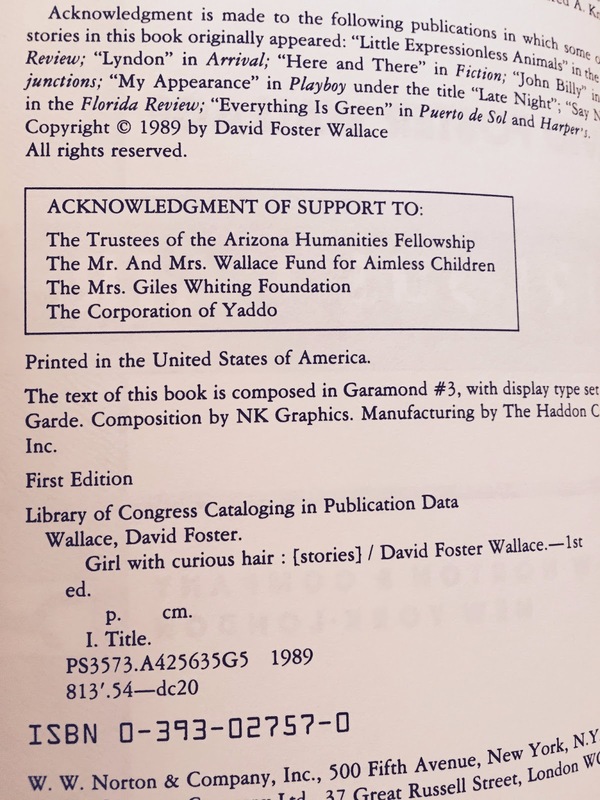 I'd picked up a substantial set of Wallace books in library sales and old bookshops over the years, and with Infinite Jest still unread on my shelf I committed to selling the collection to a local bookseller in an effort to fund an art purchase (I had thrown my signed Consider the Lobster up on eBay for a hefty sum already). Fast forward six months, artwork framed on the wall, I find myself nose-deep into the absolutely exquisite Infinite Jest and realize, perhaps too late, that David Foster Wallace was indeed one of the greats and any good library deserves the collection of books that I so coldly treated like a pawn shop cartridge-player. It's actually kind of fun to "keep an eye out" again and drift through bookstores, which is something I stopped doing once my tastes and library got a little too specific. Now I can pop in and see if someone might have a hardcover 1st of Brief Interviews... or Oblivion, which I still need to pick back up. Eyes are peeled for a 1st/1st Infinite Jest. 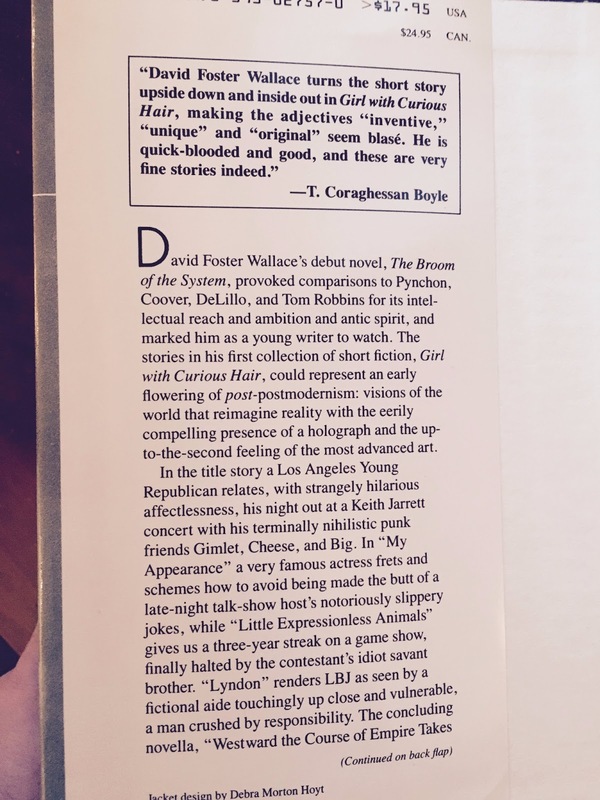 My old copy was a later printing, and not particularly valuable, so no great loss there, but reading through Infinite Jest is a massive important read and one that I think might, looking back, define this point in my life. Really special stuff. Underworld, "Barbara Barbara, We Face A Shining Future"
he corrected the text of infinite jest so a later edition (orange and blue IIRC) is the one you want to read. Thanks for your comment! I actually just finished (last night) that newish blue-and-fluorescent-green edition. I think it's the 10th anniversary one, so I'm sure it included the corrections. Curious to hear that he did that though. Do you know what changed? Anything major?